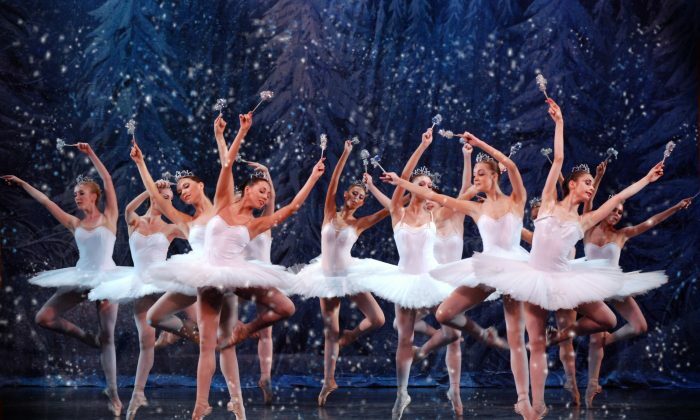 Half a dozen dancers in white leap in unison, twirl, and pause, with tutus lifting and dropping against a backdrop of snow-buried trees. More enter as the storm rises to a cacophony of sound and swirling motion. So ends Act 1. Soon in Act 2 energy explodes as Spanish dancers, costumed in huge red ruffles, radiate warmth and charm. These contrasts in mood, color, and costuming offer some of the delights found in the original version of “The Nutcracker.” But even for choreographers relying more or less on the same original libretto, sharp variations in style—according to the choreographer’s era—account for different pleasures. Marius Petipa and Lev Ivanov’s 1892 ballet emerged in the classical era of the art form. It was not tremendously successful at the time, and critics have often pointed out that the original ballet is lopsided. The first act tells a story: how Marie meets the Nutcracker and helps break the spell that transforms him back into a prince, while Act 2 has no plot development at all and includes a series of dances only. Yet choreographer and dancer Breton Tyner-Bryan, on the faculty at New York University, the Broadway Dance Center, Ballet Hispanico, and the Joffrey Ballet School, among others, was obsessed with this version when she was growing up in the 1990s. Because dance students are traditionally cast in “The Nutcracker,” as a child Tyner-Bryan appeared in the production year after year. She trained at the School of the Hartford Ballet in Connecticut, where its annual production used much of the original Petipa version. “I actually used to sneak into the theater up to the balcony when I wasn’t dancing to watch the second act,” she said. It was precisely the plotless Act 2 that thrilled Tyner-Bryan as a child: the attention given to the divertissement, the entertainment in the Land of Sweets. There is an Arabian coffee dance, a Spanish dance celebrating chocolate, and a Mandarin tea dance to an Asian flute chorus, among other delights. “It was the exposure to the variety of characters, playing up the distinction between them in movement and costumes” that Tyner-Bryan loved. Viewers sit before the pageantry of the procession, just like Marie and the Prince, enthralled by the sumptuous splendor of endless variety. There is another version of the original libretto, perhaps the most famous version, by George Balanchine. When he was young, he had appeared with the original choreography at the Mariinsky Theatre in Russia. After founding New York City Ballet, Balanchine decided to choreograph his own version of “The Nutcracker,” which became a fixture in New York City since it opened in 1954. Balanchine’s version relies on the original libretto, although he rearranged some parts (such as moving the Sugar Plum Fairy’s dance to earlier in Act 2). He even borrowed some of Petipa’s choreography directly: the hoop dance, for example. He also brought the ballet into the 20th century. Modern theater and ballet were marked by the rise of impresario directors who took control and gave a unified look to the whole. Balanchine’s version has a different aesthetic than the original, Tyner-Bryan said. He controlled every aspect of the ballet, minimizing the costumes to give the ballet a sleeker look that focused the viewer’s attention on the dancer’s body and what the dancer could do athletically. “I felt like I was watching people playing characters in the Balanchine, while I felt like I was watching a collection of people who became the characters in the Petipa. In that version all were welcome,” Tyner-Bryan said. All characters seemed to have a life of their own, somehow adding variety to the stage world, rather than being filtered through the point of view of the choreographer alone. According to ballerina and Tony-nominated actress Ashley Tuttle, Balanchine’s style is “hyper-coordinated and alive with patterns. He was a genius with patterns.” He emphasized footwork, accented jumps differently, and, in turns, had dancers spot to the front rather than to the corners of the stage as the Russians did. Perhaps most importantly, his tempos were faster than those of the original dances, she said. Irrespective of the aesthetic behind the dance, Tuttle believes it is the music that makes “The Nutcracker” endure. When her fourth-grade dance students saw the ballet and then met for the next class, they immediately recognized the music of the grand pas de deux of the Sugar Plum Fairy when it was played. “The music is so easy to absorb, and it leaves a mark,” Tuttle said. “The music is so beautiful and so specific that it alone tells the story. You can hear the snow. It sounds like snow,” she said.